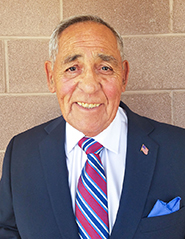 The El Paso County's Veterans Service Office honored Colonel Victor Fernandez as the recipient of the second annual Veteran of the Year award. Marshall Bosworth, El Paso County's Veterans Services officer, said the Veteran of the Year designation is "a way to honor veterans in the El Paso County community for their contributions in helping veterans and their family members." Vic has been working on bringing the Pikes Peak National Veterans Cemetery to the region for the past several decades. He has been the driving force behind project, serving as chair of the local cemetery committee. This effort led to the purchase of a 350-acre site off of Drennan Road that will become the national cemetery for our veterans. This site will be sufficient to bury or intern 95,000 veterans and their spouses. Vic worked tirelessly with national, state and local leaders to ensure that the cemetery became a reality. This included securing legislative approval and the needed funding, reviewing multiple sites, making the final site selection, and initiating the design for the cemetery. Now that the Pikes Peak National Cemetery is a reality and Vic has stepped down as chairman of the Cemetery Committee, The "Support Committee at Pikes Peak National Cemetery" has been established and will continue to support the Pikes Peak National Cemetery. Click here to read the newspaper article.